Phil Foden has been handed a Champions League start for Manchester City, with Raheem Sterling also in named in Pep Guardiola's XI to face Hoffenheim. England Under-21 midfielder Foden signed a new long-term contract with City this week and has made 13 appearances so far this season. However, the 18-year-old has only featured from kick-off in EFL Cup fixtures since the season-opening 2-0 win over Chelsea in the Community Shield. 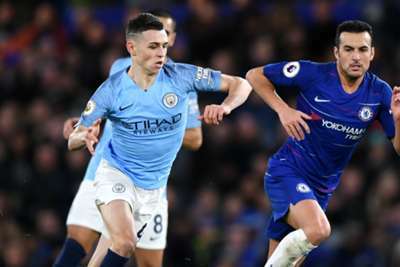 Guardiola's men lost to Maurizio Sarri's side by the same scoreline in the Premier League on Saturday – a result compounded by injuries to key midfielders David Silva and Fernandinho, which have combined to give Foden his chance as Kevin De Bruyne continues his rehabilitation from medial knee ligament damage. Sterling makes his first appearance since being the victim of alleged racist abuse at Stamford Bridge. Chelsea suspended four people from attending their matches pending an investigation, with the club and the Metropolitan Police both looking into whether the England international was racially abused by supporters. One of the men in question, Colin Wing, has denied using racist terminology but is "deeply ashamed" after haranguing the 24-year-old when he went to collect the ball for a City corner. In an Instagram post, Sterling said he expected "no better" than what he experienced in the flashpoint at Chelsea and accused the UK media of being complicit in contrasting coverage of black and white footballers that "helps fuel racism and aggressive behaviour". The former Liverpool forward has 11 goals for club and country this season and was named Premier League Player of the Month for November on Wednesday.